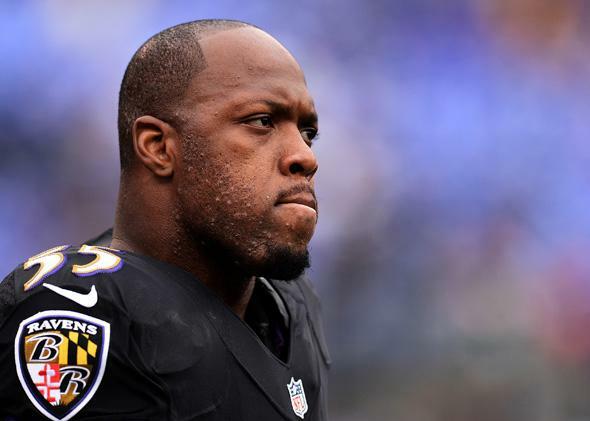 Terrell Suggs, domestic violence: Like his teammate Ray Rice, the Ravens linebacker was accused of beating up his wife. But in his case, there was no video. Why Is Terrell Suggs Still in the NFL? Like his teammate Ray Rice, the Ravens linebacker was accused of beating up his wife. But in his case, there was no video. Linebacker Terrell Suggs #55 of the Baltimore Ravens looks on during warm ups before playing the Green Bay Packers at M&T Bank Stadium on October 13, 2013, in Baltimore, Maryland. For all those similarities, there’s one big difference between Rice and Suggs: The running back’s punch was caught on tape. The linebacker’s alleged actions were not. That explains why Rice was cut by the Ravens, while Suggs is being celebrated this week for wearing a funny T-shirt mocking Pittsburgh Steelers coach Mike Tomlin. In the vast majority of domestic violence cases, there’s not a video. Ray Rice is an outlier. Terrell Suggs is not, and that’s precisely why his case is worth puzzling over. Suggs said [Williams] had hurt his arm and began yelling obscenities at her, and Williams said she spat on his chest. She wrote that she heard one of Suggs’ friends, who was present in the home, say, “Oh no, Sizz [Suggs’s nickname], come on, don’t do that.” When she turned around, according to her complaint, he knocked her to the ground and sat on top of her, grabbing her neck and holding an open bottle of bleach over her. She put her hands over the cap, but the cleaner spilled onto her and their son, she wrote. He then told her to get out of the house, dressed and left for the game, she wrote. In an area in which petitioners are asked to describe “past injuries,” Williams lists “busted lips, broken nose, black eyes, bruises,” though she did not give dates or say how such injuries occurred. Though a judge granted a protective order, Suggs did not admit wrongdoing and was not charged with a crime. A social worker also said that allegations that Suggs had abused the couple’s son could not be substantiated. A short time later, Williams withdrew a multimillion-dollar lawsuit against the Ravens star and asked for the protective order to be rescinded, as the couple was attempting to reconcile. Again, Williams soon asked for the protective order to be removed. Again, no charges were filed. In the midst of all this, Suggs released the following statement: “My fiancée and I have two beautiful children together whom we both love and care for tremendously. The personal issues that the two of us have faced recently have been addressed in a responsible and adult manner and have been resolved. I am certain that we will get through this matter and move forward as a happy family.” A few days later, Suggs and Williams were married. The Ravens’ awareness and the NFL’s vow to “take a look at it” did not lead to any concrete actions. I was unable to find any follow-up reports from either the team or the league—what they found after “taking a look at it.” There have been no public reports that Suggs was fined, suspended, or otherwise punished by the Ravens or the NFL for either of these alleged domestic incidents. I reached out to both the Ravens and the NFL to ask whether either entity has conducted an investigation of Suggs, or whether he’s ever been subject to any discipline. I have not heard back from either the team or the league, but I’ll update this piece if I do get a response. It’s not just the NFL that didn’t take the allegations of abuse seriously. Suggs’ case shows that without video evidence of an alleged crime, the press will move on, too. While his domestic disputes were covered amply in 2009 and 2012, the football media quickly pivoted to focus on Suggs’ goofy claim that he attended “Ball So Hard University.” Rice is a pariah; Suggs reads mean tweets on Jimmy Kimmel. Hardy, Holder said, flung her from the bed, threw her into a bathtub, then tossed her on a futon covered with rifles. Holder said Hardy ripped a necklace he had given her off her neck, threw it into a toilet and slammed the lid on her arm when she tried to fish it out. The 6-foot-4, 265-pound Hardy dragged her by the hair room to room, she said, before putting his hands around her throat. “He looked me in my eyes and he told me he was going to kill me,” said Holder, 24, who said she used to live with Hardy. York is right—it’s not fair to immediately cut every player who’s accused of domestic violence. But it’s also not acceptable for a team to say it’s going to “take a look at it” and then do nothing. No criminal charges were ever filed against Terrell Suggs, but a judge did find a laceration on Candace Williams’ chest. That laceration is a real thing. It existed. The Ravens shouldn’t be able to pretend it didn’t. The best analogy here is to the awful scourge of sexual assault on college campuses. In addition to going to local police, a student can have her complaint heard through a campus adjudication procedure, one that uses “the preponderance of evidence” as a standard of proof rather than a “beyond a reasonable doubt” standard. (As Emily Bazelon has explained, preponderance of the evidence means “reviewers must find only that it’s more likely than not that the sexual assault or harassment occurred.”) There are problems with these campus systems—the New York Times story on Hobart and William Smith Colleges offers a harrowing account of all that can go wrong—but at least they acknowledge the existence of something akin to institutional responsibility. At least before TMZ released the Rice video, such a concept did not exist in the NFL. Teams have long operated on the assumption that they could say they’re “aware of the situation,” and then just pretend like nothing happened as soon as the news blew over. At some point, individual teams may decide that it makes sense for them to move to a preponderance-of-evidence standard—to decide that it’s in their best interest to cut a player if it’s more likely than not that he’s a domestic abuser. I don’t know if we’ve reached that point yet, but the Rice video has gotten us closer to that day. Seeing a sports star clock his fiancée in the face has changed something—for fans, for the media, and ultimately, I think, for the teams. If it doesn’t, then the NFL’s problem with domestic violence runs even deeper than we thought.